One point access to MySpace, Facebook, Blogs, Flickr, YouTube and more. Notifications of new comments, messages, friend requests, videos, feeds, and more – in real time. An instant messenger where you can easily chat and share content with your social network friends. A way to organize your social media content (pics, videos, posts) in one place. It’s time for 8hands, ’cause constantly checking all your social sites is so 2007. Posted on Saturday 19 January 2008 Thursday 14 December 2017 Categories WebTags 8hands, social networking4 Comments on Do you have 8hands? 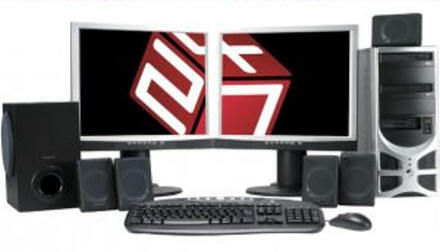 I still can’t quite believe it: I’ve just ordered myself a new PC from Cube247. My current PC has been slowly dying over the last few months. Even after a complete reinstall it falls over during the most mundane of tasks: watching video online, ripping CDs to MP3, erm … checking the time. It did it again this morning. I complained (again!). Lovely Jane turned to me and said “Just order a new one!” So I did. Having been pricing it for the last couple of months, and doing a bit of digging around for the right spec, I decided in the end that convenience would take precedence over adventure and I’d just order a complete system rather than build and tweak it myself. I’d been impressed with the reviews that Cube247 were getting and it turned out to be cheaper too (to buy rather than build) for the kind of spec that I wanted. I wanted at least an Intel Core 2 Duo E6750, and the recent CPU group review in Custom PC magazine this month helped me to choose. The Intel Core 2 Quad Q6600 scored second in the “Bangs per buck” category (E6750 was first), and 13th in the “Overall” category (E6750 was 17th). I might even be able to get in a full game of Minesweeper quite comfortably on that setup. Quite a step up from my current AMD Athlon XP 2800+, 1 GB RAM, ATi Radeon X700. But as you can see from the spec above I’m sticking with Windows XP Professional for now. It’s worth pointing out too that this is the first time in my desktop PC-buying experience that I’m going for an Intel/Nvidia combination of CPU/graphics card rather than AMD/ATi. Just goes to show that Intel and Nvidia are clearly ahead of the game right now. All being well, it arrives on Thursday.